Due to conflicting events, the normal meeting room at the York County Museum would not allow the regular scheduled astronomy program to take place and had to be cancelled. After finishing the CCAS monthly newsletter together one night, Tom English received a call from Bob Eskridge, who would inform him that the Rock Hill event was being cancelled. There was a discussion between Tom and Bob about the possibility of the Cleveland County Astronomical Society taking over this event. It was agreed by all concerned that the CCAS, would host a new event, titled “The Regional Meeting of Amateur Astronomers,” also to be known as, “BoBfest.” The meeting would include, astronomy speakers, vendors, solar observing, a swap table, and most importantly the opportunity for amateurs in the region to just get together and have a good time. Shortly thereafter, plans were already being made to host the “Regional Meeting of Amateur Astronomers” at the Ritch Banquet Hall, on campus of GWU. The date was set, Saturday, January 23rd 1993, and the rest is history. Tom English did not feel like he should serve as president, but was the catalyst of the club in many ways, for a lot of years. However, Tom did become the newsletter editor. If not for Tom, who was Professor of Astronomy and Physics at GWU at the time, we would not have had access to the Williams Observatory for our home and meetings. This allowed for stability of the club, which was critical for it’s survival in the early years. 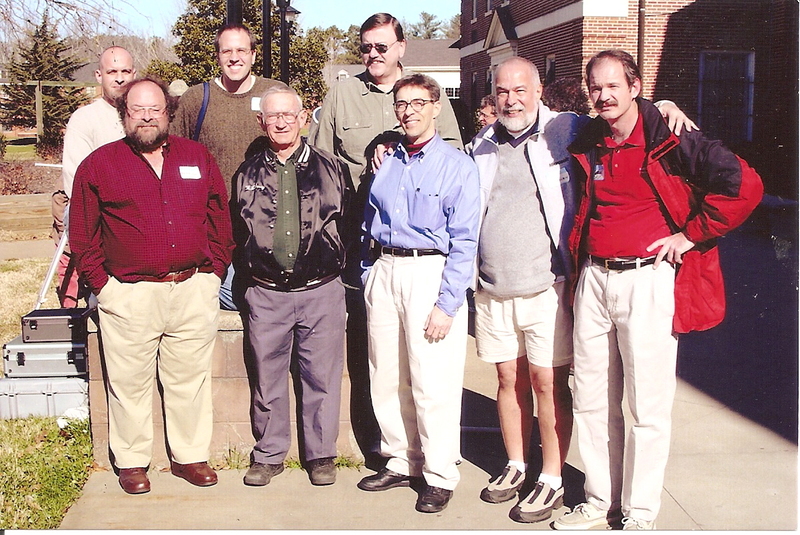 I found this nice photo of former presidents and officers of the CCAS, also Tom Lorenzin, author of 1000+ The Amateur Astronomer’s Field Guide to Deep-Sky Observing. The picture was made in January of 2003 outside the Ritch Banquet Hall. This entry was posted on October 13, 2011 at 12:24 pm and is filed under Roger's Articles. You can subscribe via RSS 2.0 feed to this post's comments. Both comments and pings are currently closed.